Megan Koter saw on campus the statue of Atlas with the world on his shoulders, and she knew. HPU, she thought, could be her place. “Sometimes, I feel like I carry the weight of the world on my shoulders,” she says today. “But when I saw Atlas, I felt that was a cool validation that someone else would help me carry it. Koter is the Extraordinary Leader for the month of November. 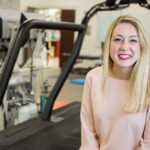 She’s a member of five honor societies and the assistant resident director for York Hall and Point Place Apartments . 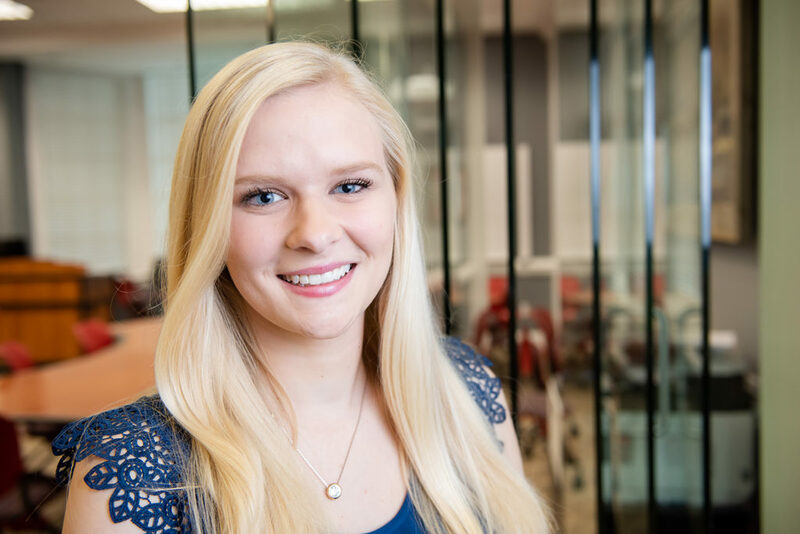 She’s an executive board member for HPU’s Title IX Organization and president of Psi Chi Honor Society, a campus organization for top psychology students. And in May, she was a junior marshal at commencement. 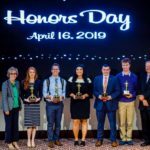 That distinction honors the top students of her class. Ask her about all that, and she’ll say she never thought that would happen. Ask her to explain, and she’ll begin with a story from middle school. And to Koter, a senior psychology major, that’s when she began shouldering the weight of her world. In seventh grade, Koter couldn’t keep her seat. 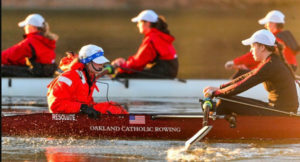 Koter became a coxswain her freshman year at Oakland Catholic High School. She became the first-varsity coxswain her junior year. She constantly moved around the class and talked to her classmates. Her teacher, though, had enough. She called Koter “unteachable” and put her out in the hall. Koter’s classmates came out and taught her what they were learning on the other side of the door. That really didn’t help. Koter began to feel she wasn’t good enough or smart enough to succeed. She fought that feeling as a teenager. Koter went to an all-girls Catholic high school where competition reigned over everything. She joined the rowing team, and by her junior year, she became the first-varsity coxswain — “the coach in the boat,” Koter says. That distinction brought stress. It only got worse. Everyone she knew in school competed against one another over who could get the better grades. Koter worked hard, but she often wrestled with self-doubt and anxiety. At HPU, Koter never felt that. She found a supportive faculty and a supportive sorority. She found people who looked at life the same way she did and saw college as a learning adventure rather than a mind-numbing grind. 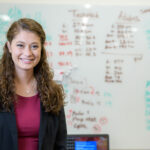 By her sophomore year, Koter became a resident assistant to first-year students in Blessing Hall. During her two-year stint, she had many conversations with students on her hall, and she discovered mirror images of her younger self. Koter’s attitude on life had changed because her outlook had changed. 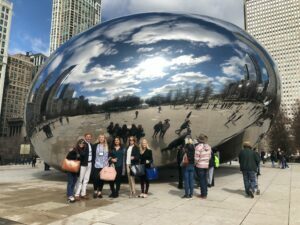 Last spring, Koter attended the International End Violence Against Women Conference in Chicago where. Left to right are HPU professor Jenn Brandt, Tucker Wilson, Alexis Ogren, Lyndsey Clos and Niamh Tattersall. Koter is on the far right. To figure out how, start with Koter’s freshman year. 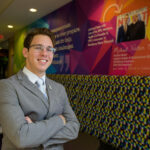 Koter came to HPU from Wexford, Pennsylvania, a small community 20 minutes north of Pittsburgh. She heard about HPU through her high school’s academic counselor, and when she came, she knew only seven people. Koter roomed with Melanie Moravec her freshman year. Moravec came from Apex, North Carolina, a suburban town near Raleigh. The two studied together and talked for hours. Today, they’re the best of friends. Koter also wanted to advocate for issues she cared about. One was domestic violence. Koter always felt angered by how women were objectified by society and how prevalent domestic violence against women had become — one out of every four women, Koter says. So, Koter got involved with HPU’s Title IX Organization. The group showed Koter how to push for change. Last spring, she attended the International End Violence Against Women Conference in Chicago where she made contacts and learned how to advocate in the future. 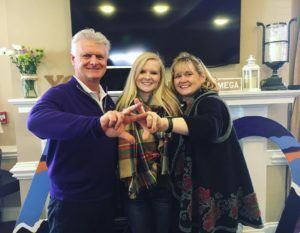 Koter showed her parents, Randy and Bernadette Koter, how to do her sorority’s symbol with their hands inside the Alpha Chi Omega house. Dr. Greggory Hundt, the chair of HPU’s psychology department, showed her how to challenge herself. Dr. Hundt is Koter’s advisor. She has taken three classes with Hundt. In every class, Dr. Hundt found a motivated student hungry to learn. 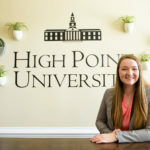 When Koter came to HPU, she hardly knew anyone, and she roomed with someone she didn’t know — freshman Melanie Moravec from Apex, North Carolina. They’ve been best friends ever since. Koter has been a tutor and a peer navigator for first-year psychology students. She has organized events such as Mental Health Awareness Week on campus, and next semester, she wants to volunteer helping veterans struggling with post-traumatic stress. She doesn’t want people to suffer in silence. She has. But she’s much better. She wants other people to be better, too. Koter will graduate in May. She’ll leave HPU with a minor in English literature to complement her major in psychology. She expects she’ll take a gap year and work in human relations. Then, she’ll enroll in graduate school and focus on what she really wants to do next. Be a school psychologist. She wants to help students just like her younger self. So, what would this confident 22-year-old tell her seventh-grade self today? Ask Koter that, and her answer comes quick. It has for Koter. With the help of HPU.